Nowadays we are surrounded by 'attention' data about music. 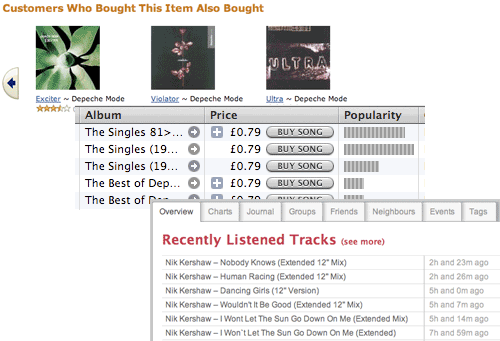 Amazon tells us that other people who bought the same music as us also liked something else. The iTunes music store gauges the relative popularity of tracks from an artist. Last FM allows us to let all our Facebook friends know what we've just been listening to - however embarrassing it might be. And we miss it when it isn't there. When I left the UK in December 2005, my PC remained in bubble-wrap in London for 15 months, so I didn't get to synch my iPod with iTunes very often. In some ways this was very bad, because if, as on one occasion, Apple's DRM screwed up during the synch, I didn't get to listen to some of my purchased music until I returned to the UK again to sort it out. In other ways, though, this was great, because every time I did synchronize it, I got a really good snapshot of what I'd listened to in the previous couple of months. I usually took a copy of the library file which included the play count information, and had a mess around with it in Excel to see what was rising or falling in popularity. More than anything though, having that detailed play count for everything I'd listened to in the last two years showed up the lack of information I have about the previous 30-odd years of my listening history. I really wish there was an XML file that detailed my listening habits from 'the year dot'. And what a complex set of data it would be. The way that I have assembled what we now call 'playlists', and the way I have organised my music listening has radically changed in my lifetime. This is not only due to me growing up and becoming more aware as a consumer, but also due to the different formats and different types of metadata that have been associated with music in the thirty-plus years that I have had an interest in it. Back in 2006, one of my ex-colleagues Dan Hill wrote an excellent essay - New Musical Experiences - that emphasised some of the detail that we have lost along the way. 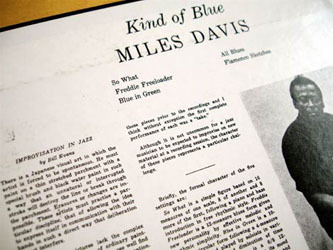 The transition from 12" vinyl rock'n'roll album sleeves to virtual bits'n'bytes has been disruptive in terms of the information that accompanied a musical release. When you used to talk about 'volume control' in the sense of music, it was associated with how loudly you could annoy your parents or neighbours. Nowadays it is more likely to refer to the sheer volume of digital media in your possession. 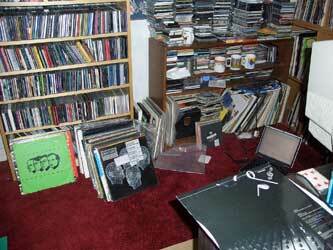 At the end of March 2007 I had 15,741 tracks in the iTunes library on my PC, of which I had played 4,084 at least once. That represents 25.9% of the titles, or just a shade over a quarter of the tracks. Meaning that, according to iTunes, I had never listened to around three-quarters of my collection. I'd taken the time to rate 2,680 tracks. 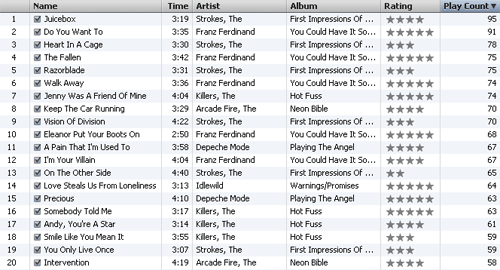 Yet, again, according to iTunes, of the tracks that I had rated, I had never played 38% of them. Rating has become the new "volume control" for music consumption. With a library that large, rating songs allows us to narrow down what we actually want to hear, rather than what we simply want to have. Now, despite what those figures say, it isn't the case that I've bought, borrowed or stolen 11,657 songs without ever hearing them - although for sure some of them I have never heard. What it mostly means is that these songs are tracks that I haven't played since I first started using my iPod / iTunes combo in 2005.
iTunes comes pre-equipped with a dynamic playlist that keeps a track of your 'most listened to' songs. I got to thinking about what that list would look like if it really was counting my 'most listened to' songs of all time - would there be tracks and bands that I would never be able to dislodge from the top spots, simply because I had played them so much in my youth? So, in the next part of this series, I want to examine how I experienced and controlled the music I listened to in my very formative years. Parts of this (#8, 10-12) aren't displaying in Internet Explorer. Switching the ends of comments from --> to --!> makes it work again. There's a column on the right side containing a bio, & that shows up then too.